I wrote about how my grandparents met as a result of a contact ad in a Newspaper in 1919. The post is called Serially Lost- Part Three. It was created by the cooperation of two famous Danish artists of that time Joachim Skovgaard (1856-1933) and Thorvald Bindesbøll (1846-1908). It was put up in 1904 at the new Town Hall Square with out the water basin around it. In 1908 the water basin was added to the enjoyment of the many children in Copenhagen. Removed again in 1954 as the Hans Christian Andersen’s Boulevard was widened. People’s wit gave it the name “The Spittoon” so in 1923 a bull fighting a big snake or dragon was put on the top. 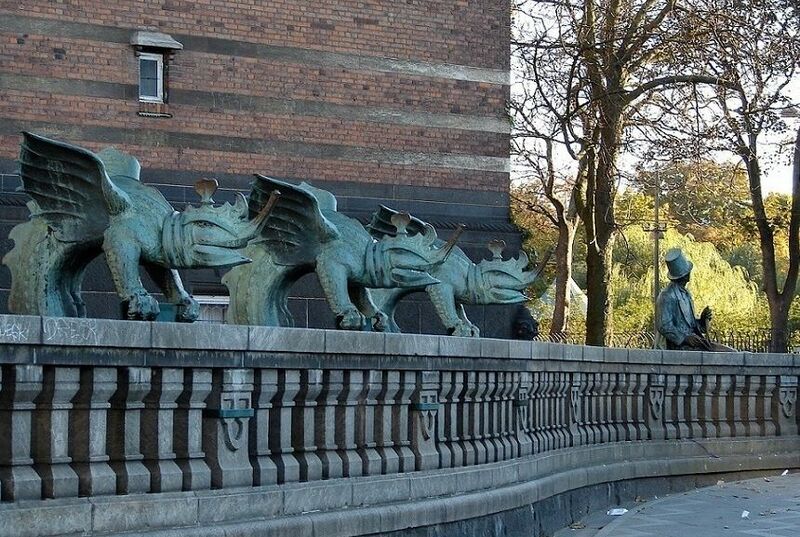 The dragons on the sides were put on the fence of the Municipal House where they still can be seen and some smaller ones were put on the inner water basin. In 1954 the Hans Christian Andersen’s Boulevard was widened so much that they had to move the fountain and get rid of the outer water basin. That gives it a rather awkward look and is hardly seen by others than keen Asian tourists taking photos of everything. A Metro station is being built at the Square and it is hoped that somehow the fountain could be replaced and regain its former basin for the joy of generations to come. Interesting to see how it has changed. We tear too much down here. I hope they will restore it as the Metro is going to change the Square. I am sure it will be kept there.